I take a general interest in orders, medals, decorations, uniforms, insignia of: The Netherlands; Germany & German States 1800-1950; Great-Britain 1800-1950; Belgium 1830-1950; France 1800-1950; USA 1900-1950. Also I collect images (photos, postcards, prints, other documents) related to the above; German award documents (Besitzzeugnis & Urkunde); French campaign medals. Germany and NS Organisations between the wars - in particular Reichsarbeitsdienst (FAD, RAD, RADwJ); HJ. German Sailing Training Ships & Kriegsmarine in general. Dutch Colonial Army and Navy. Royal Navy & Scots Guards. On further notice, I agree with Slicht & Angolia, that the "K" Schulterklappe is probably dating from the Reichsmarine. "Kanal" seems odd to me, because the Germans did not get to the Kanal before June 1940, and by then all tactical information (Roman numbers and letters) had been removed from the Naval Schulterklappen for reasons of security. So why add tactical information when a year before all these characters were removed? The "K" from the Reichsmarine would indicate "Küste", this could be Küstenverteidigung or Küstenartillerieschule. 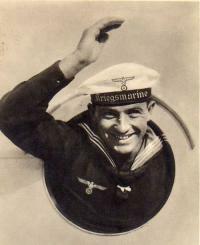 The Schulterklappe could have been worn in the early days of the Kriegsmarine, but fact is, that it does not show up in any KM regulation (so far). So, my educated guess would be, as the "K" is visible only on one person, that he is a reservist wearing his old Schulterklappe. I know nothing about large or smaller "K". Very nice Morten, Excellent stuff! A very very nice and interesting photo. Obviously the funeral party are Luftwaffe, to bury one of their comrades, but the Catholic chaplain is of the Army. Because Goering would not have any chaplains at all in the Luftwaffe, for the occasion of military funerals, chaplains had to be "borrowed" from the Army or Navy. Another interesting portrait, with information. We see a Maschinen-Obermaat of the 1. Komp. Marine-Stabsabteilung Festungskommandantur LS Gotenhafen [1st Coy Navy Staff Unit of the Garrison Administration Gotenhafen - presenty named Gdynia], the photo is dated 5 April 1940. Interesting to note the crossed anchors below the letter "O" (for "Ostsee"), the early style cap with woven roundel and oak leaves. Also interesting to see his ribbon bar, which denotes that he is from Austria, with 2 medals for bravery in the Great War. Looks like him very much, thanks! That's a nice one Morten, never seen the like of it! An interesting studio photo. The sign reads: "3. Schiffsbatterie // Mondsüchtiger an der Arbeit // Munster 1939" [3rd Ship's Battery // Moonrakers at work // Munster 1030] The photo was taken in Munsterlager, a Truppenübungsplatz [Military Training Facility, like Aldershot]. The men are wearing Army uniforms, with the Arab number 83 on the shoulder loops. Some of the men are wearing the old style Schnurstiefel [Lace boots]. It is puzzeling that the tekst reads "3. Schiffsbatterie", a unit to be connected with the Kriegsmarine, but the uniforms and insignia are Army.